About 6 months from my birthday every year I take a self check diet wise. This is especially important for someone like me who has enjoyed a Pescetarian diet for over 5 years. It’s been a journey to make sure that I’m replacing the vitamins and nutrients in meats to keep myself healthy. My latest self check was not so good. I was eating out too much, I wasn’t cooking consistently, I was eating too much fish! After I realized that the 10-15 pounds that I gained came from these factors I decided to get back to cooking and eating healthy. 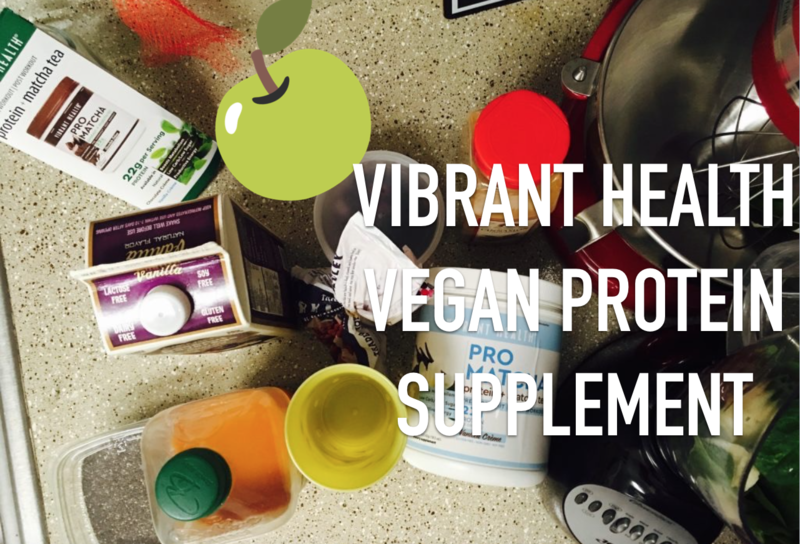 Vibrant Health and I decided to collaborate so that I could try out their vegan dietary supplement and share my experience here. I’ve never tried any type of dietary supplement outside of vitamins, so this whole “protein powder” thing was very new to me! Vibrant Health offers an array of protein supplements on their website, but after exploring the page and looking through reviews I decided on Pro Matcha. MATCHA is a specially grown and processed green tea. The whole tea leaf is consumed providing an arsenal of nutrients, vitamins, minerals, antioxidants, and amino acids  making it one of the healthiest beverages on earth. To match the potency in a single serving of Matcha, you would need to drink at least 10 cups of green tea. After exploring the website I saw that they offer several options in Pro Matcha – Natural, Chocolate Creme and Vanilla Creme. Because I eat a lot of berries and like to flavor my green smoothies with cinnamon and nutmeg, I thought vanilla would be a great choice. Caffeine? Yes! I’ve been very vocal with my friends and family about being caffeine dependent. However, the cool thing about the caffeine in matcha is that it’s alkalizing not acidic. The less acid in your body the better! The Plan? Adding this powder to the smoothies I made on occasion, but having a smoothie every morning or every other morning. I knew that making a smoothie this often would motivate me and kick start my cooking schedule. The most important thing for me when I’m trying to improve my diet is to make small changes and stay consistent. I’ve never been able to be consistent with trying to change everything at once. In fact, I gave up meat one at a time: pork, then beef, then chicken and turkey. At first I thought I had used too much of the powder but I just needed to get used to the difference between these smoothies and my normal all fruit and veggies smoothies. It was delicious! One thing I would suggest is to get some reusable straws, this shake was so creamy, I would have had a REALLY difficult time drinking it without one. Here’s another smoothie I made the other day. I noticed that I couldn’t taste the 100% carrot juice so I started adding more each time I made one. With the recipe that I stuck to it faithfully gives me 3 cups, which is standard for a regular sized serving (mason jar, refillable bottle). While my smoothie is still blending I add the cinnamon, nutmeg and chia seeds to help disperse each evenly. My plan worked! I really looked forward to making my smoothies every morning because of the Pro Matcha protein supplement. From simply knowing that I was getting great vegan plant based protein to just loving the variety of ways I could use the powder to get different tastes! Routine is SO helpful when trying to make changes and starting my day off with a Pro Matcha smoothie sets me up for my day. I’ve got great energy now and use it to prepare the meals I’ve always wanted to. Want to try Pro Matcha or any of the Vibrant Health products for yourself? Use promo code KGLIFESTYLE at check out for 20% off of your entire cart! Excludes sample packets and sales items and expires on 4/1/17. So, I feel like I’m late to the game on this protein supplement thing. I think for me and my diet it’s LONG over due. I have promised some recipes for some of my favorite dishes and I have NOT forgotten about you! Let me know below if you’ve ever tried matcha, your experience with protein powder? See you in the comments below!